By Ben CohenEddie Box Jr. is a 66-year-old member of the Southern Ute Indian Tribe of Colorado who hasn't skied in 40 years. Yet he wasn't entirely surprised when he received an unusual invitation this month from a Vail Resorts representative. Once again, Mr. Box was being asked by executives at the country's skiing mecca to perform a snow dance. Mountain resorts across the U.S. are desperate for fresh powder. For the first time since the 1800s, Lake Tahoe received no December snow. Peaks in the Northeast saw rain. Vail Resorts recently reported a 15% decrease in total skier visits at its six properties, and not for 30 years have Vail Mountain's back bowls, perhaps the most prized terrain in the country, been roped off so late in the season for lack of snow. But on Thursday, Vail's bowls finally opened, thanks to 25 inches of snow that has fallen since Mr. Box's snow dance on Jan. 7. The day of the ceremony "really feels like it was a big change in the weather pattern," said Chris Jarnot, Vail Mountain's chief operating officer.Comment: It snowed on a mountaintop in winter? Amazing! That proves Native religion works! Actually, I've never heard of a snow dance. I wonder if Utes invented this dance recently, perhaps to cash in on the drought. I can't imagine that they danced for snow in the days before central heating. After all, why would a pre-industrial tribe facing a cold winter want more snow rather than less? Under what circumstances would this tribe seek to increase the likelihood of hunger and disease? Unless you're a ski resort, snow is a drawback, not a benefit. It's an obstacle to survival. For more on Native religion, see Indian Bob Identified and Library Blocks "Occult" Native Websites. 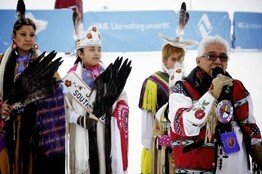 Below: "Eddie Box Jr., right, of the Southern Ute Indian Tribe performed a snow dance at Vail Mountain on Jan. 7."